Ketosis is an alternate metabolic state in which your body utilizes fat, both from your diet and your body fat stores, as well as ketones, a by-product of fat burning, for energy. Low-carbohydrate diets can induce ketosis. To stay in ketosis, you need to decrease your consumption of foods such as oat meal, which contain carbohydrates. Although ketosis is usually not dangerous and shouldn't be confused with diabetic ketoacidosis, some people experience side effects. Consult your doctor before embarking on any new dietary program. Oats are the grain from which oatmeal is made and like all grains, are rich in carbohydrates. A 1/2-cup serving of dry oat flakes provide 29 g of carbs and 4.8 g of fiber, while a packet of instant oatmeal containing added sugar and flavorings contain an average of 33 g of carbs and 2.8 g of fiber, according to the USDA National Nutrient Database. 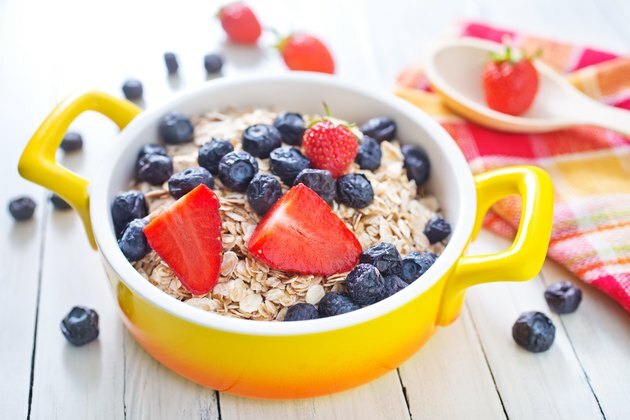 Most Americans consume their oatmeal with sugar, which contains an extra 12 g of carbs per tablespoon, yogurt, which contains between 15 and 30 g per 1/2 cup or dried fruits, which contains about 15 to 30 g per tablespoon, making oatmeal a high-carb meal or snack. To stay in ketosis, most people need to restrict their daily carb intake below 50 g a day, although some people may need to be even more restrictive. Although oatmeal is rich in carbs, you can include it in your diet and stay in ketosis if you count your carbs and stay below this threshold. The best way to confirm your body is in ketosis is by checking your urine with ketone sticks, available over-the-counter at pharmacies. If your ketone stick changes to a purple color, it indicates the presence of ketones in your urine and confirms that you are in a ketogenic state. If you really want to keep oatmeal in your ketogenic diet, you might need to cut out all other carb-rich foods from your diet to prevent consuming too many carbs. Avoid all other grains, including pasta, rice, couscous, bread and crackers, starchy vegetables, such as potatoes, corn and peas, fruits, milk, yogurt, sugary drinks, sweets and desserts. Most of your carbs should come from nonstarchy vegetables, which are the best source of some important vitamins, minerals and fiber on your ketogenic diet. If you restrict carb-rich foods, you can include a limited amount of oatmeal. Track your carbs to ensure you do not exceed 50 g of carbs a day. If you want to have oatmeal for breakfast, have a small amount: 1/4 cup to 1/2 cup measured dry, which contains about 12 to 24 g of available carbs. Choose old-fashioned oatmeal, because larger flakes are digested more slowly and will help keep your blood sugar levels more stable. Avoid sugar-containing flavored oatmeal because of their higher carb content. Prepare your oats with water. Avoid sweetening your oatmeal; rather, serve your bowl of oatmeal with cottage cheese and a tablespoon of peanut or almond butter. Add cinnamon for a touch of sweetness and your oatmeal will contain a total of 15 and 30 g of carbohydrates, depending on the serving size.